Shortly after the arrival of the Northern Autumnal Equinox last week, two large arcuate-shaped dust storm fronts swept eastward from Acidalia to Deuteronilus and further eastward towards the plains of Utopia. Looking to the southern highlands, dust lifting activity was at a local minimum for much of the week. A couple of tiny transient dust storms were spotted over Syria Planum and the slopes of Arsia Mons, the southernmost volcano of the Tharsis Montes. 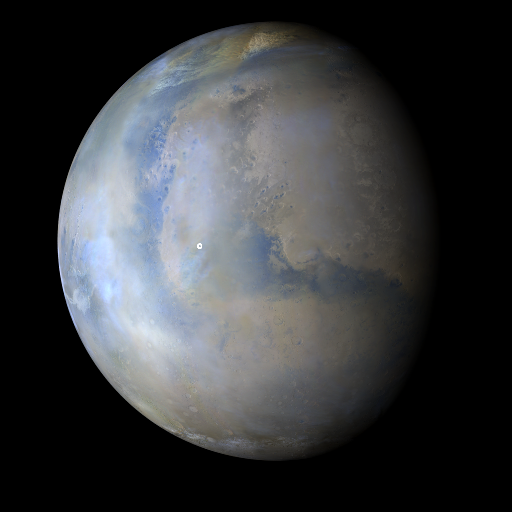 Each afternoon, orographic water-ice clouds persisted over Tempe Terra and the major Tharsis volcanoes. The rovers sites, Gale Crater and Endeavour Crater remained storm-free all week. Malin, M. C., B. A. Cantor, A. W. Britton (2018), MRO MARCI Weather Report for the week of 21 May 2018 – 27 May 2018, Malin Space Science Systems Captioned Image Release, MSSS-532, http://www.msss.com/msss_images/2018/05/30/.